To say that video has become one of go-to marketing tools over the last couple of years feels like an understatement. Video content has seen astonishing growth, with Cisco predicting that by 2021 80% of all Internet traffic will be video. Consumers are eager to watch more videos and brands are responding accordingly. From Facebook’s video-first approach to Google showing even more videos in the SERPs, everybody is making their move. And so should you! However, that might be easier said than done. It’s not just a matter of putting out videos and hoping for the best. Anyone looking to make it with video marketing has to compete with 300 hours’ worth of video being uploaded every hour – and that’s just YouTube alone! That’s why you have to provide more than just high-quality videos. You need to tailor them to your audience to maximize your brand’s visibility and increase the chances that the viewer will connect with your message. 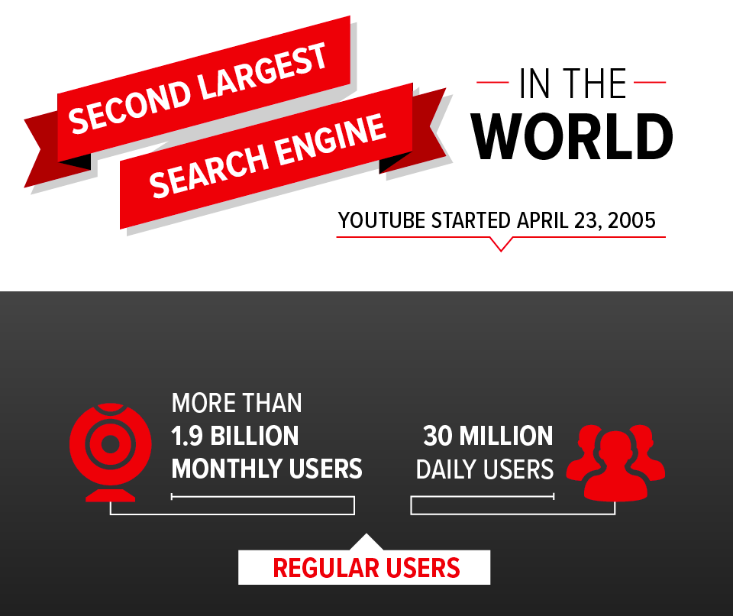 Now, you might think general search engine optimization would be enough for video, but you’d be wrong! While applying the basics of SEO does certainly help, your best bet is to take a page from the experts! Every explainer video production company worth their weight in salt knows that you need to use video-specific SEO strategies if you want to stand out. This means learning all about the specific SEO areas that affect video rankings – things like the platform you use to upload your videos, where you embed them, and even seemingly menial things like their thumbnails are what will make or break your videos’ performance. Feeling a little bit lost? Then read on, as I’ll run down the 9 SEO areas you have to focus on if you want your video to be watched. Of course, whenever you upload your videos to a third-party site (that includes YouTube! ), then all the traffic collected by your videos will stay on those sites. That’s totally fine if you want more visibility and brand awareness, but I’m pretty sure you can use your videos for more conversion-led actions. For instance, you should always embed a video on your landing pages, as they can boost conversions by an incredible 80%. Uploading videos to social networks is also a great way to gain exposure and generate engagement. Why? Well, 45% of people watch more than an hour of Facebook videos while 82% of Twitter users watch video without leaving the platform. Putting your videos in your blog posts (be they your own articles or articles you guest post on) can also lead to reduced bounce rates. This is important if you want to get your message across to people who got to your article by chance. This may not seem that specific to video marketing (as it also applies to blog posts), but it’s truly worth mentioning. Titles and descriptions play a huge part in how your videos are ranked. People still search for videos through keywords, so it’s very important to use them both in titles and descriptions. This doesn’t mean you have to sacrifice your title to the keyword altar, though. Please, oh please, don’t jam your target keywords in there just for the sake of SEO. Instead, craft a title that sparks your audience’s curiosity. Writing “10 basic chicken recipes” is not the same as “Roasted, baked, stuffed and 7 more delicious chicken recipes.” The second one is clearer, more eye-catching and even uses other keywords that may help you rank. The same goes for descriptions. You might feel like you can go longer with them, but stick to the core message. Use another one of your target keywords and be sure to include a CTA to give your audience a next step they might want to take, be it a similar video, a landing page or a freebie. The title – Braidy Industries – Motion Graphics Explainer Video – is short, clear, descriptive, and includes relevant keywords. All in just six words! The description contains a brief and simple profile of the content, followed by the company’s relevant information, contact, social media platforms, and a call to action. All the elements you want in your own content’s descriptions. Many people I’ve known over the years have treated thumbnails as little more than an afterthought. Most of the time, they let platforms automatically decide on the thumbnail for each of their videos. But if you look closely at the most popular YouTube channels, you’ll see that seasoned video makers always bet on one thing: customized thumbnails. That’s because they treat those tiny images for what they are – a captivating representation of what audiences can find in the video. Think of thumbnails as book covers that people will (sometimes sadly) judge before clicking on them. That’s why you have to use an image that’s not just representative of what’s in your video. It also has to be an eye-catching image, powerful enough to stand out in the sea of thumbnails that surrounds it. 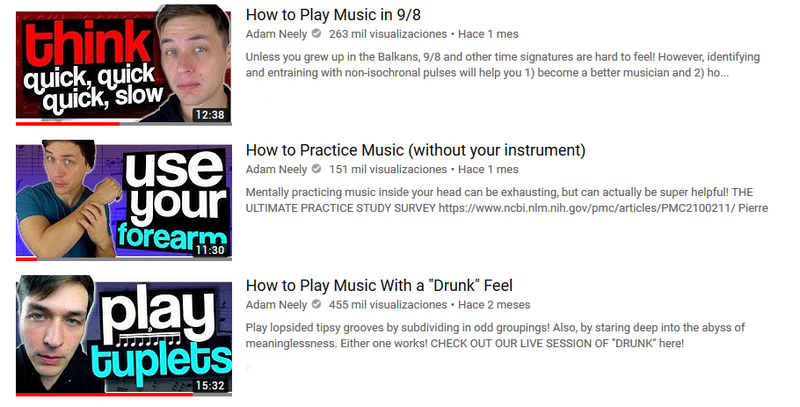 As you can see, he’s already giving away something more than the title implies and spark even more curiosity (how the heck do you practice without an instrument AND using your forearm?). You should definitely follow his example as great thumbnails can boost your click-through rates. It’s only natural, then, that video marketers have started to include subtitles on all of their videos. These are combined with video transcripts to help deliver your message – even if people can’t be bothered to turn on the sound. Additionally, you can use the video transcripts whenever you embed a video onto one of your site’s pages. There are two reasons why you should do that. The first is that you are giving people the option to read the content rather than having to sit through the whole video (which is great for longer videos). In case I haven’t made my point clear enough – we’re living in the video age. That means that people are getting more and more used to watching videos as their primary source of information. What you should take away from this is that videos should be among your top priorities across your whole marketing strategy. In other words, you have to embrace the full power that your video marketing can give you. That includes building the pages of your website and your landing pages around the videos. Make your videos the stars of your content! Put them in the spotlight! What does that mean? It’s pretty simple: don’t hide your videos. Don’t make people scroll to find them, don’t make them push tiny buttons or browse endless menus. Instead, put your videos above the fold, make them the first thing that your audience sees when they get to your website. 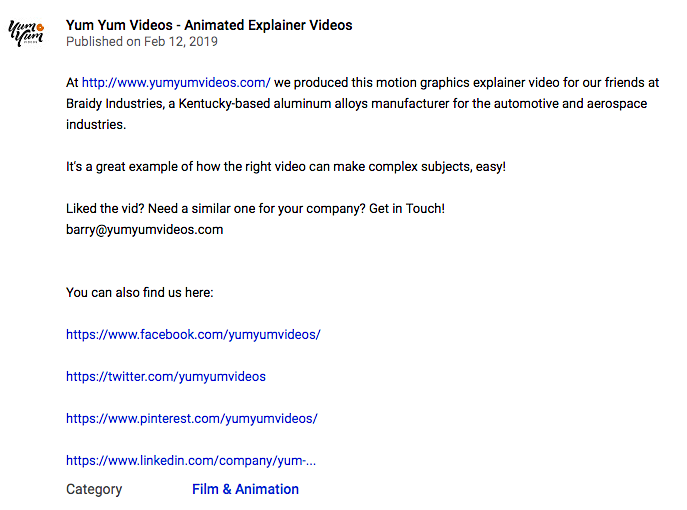 This works great for explainer videos where you explain your service, but it’s also suggested for company videos, how-to videos and just about any other video you have. That’s especially true for videos on landing pages, since, as I mentioned already (but it’s worth repeating) that videos can increase your conversion rates by up to 80%. As fantastic as this tip is, please don’t abuse it. Keep reading to know why. If you have a nice video catalog for your brand, products and services, you’ll feel tempted to put all of them in the spotlight. I mean, it’s understandable! You want to show the hard work you’ve been doing. This, however, can backfire. I’ll let Google explain: “Create a standalone landing page for each video, where you can gather all its related information.” Basically, they are saying that you should put yourself in the “one video per page” frame of mind, as that makes it easier for Google to index your video. This doesn’t mean you can’t create some sort of video hub on your website, where you put up a bunch of your videos. Keep in mind, though, that if you do that, you’ll need to pick your most relevant video, and put it on top. I should clarify what I mean by “relevant” since there are two different meanings hiding behind that word. For one, the video should be relevant to the visitor. In other words, it should be about the topic that the visitor is expecting to see: chicken recipes, not just recipes or the history of chickens. However, if I had to give you one piece of advice, it’d be this: just use one video per page and focus on reinforcing its message with all the things that are around it on that page. You’ll get much better results by doing that. If you follow the suggestion above, then you definitely need to make all the content on the landing page work for the video. What I’m saying is that you have to do more than just optimize the video – you have to tweak the text, the images and all things meta. Think of it like this: if your home looks horrible on the outside, no one will knock on your door, even if the interior looks like Buckingham Palace. That’s what search engines feel when your page isn’t optimized. They come around, see the mess and leave without crawling. So, you have to tidy up the place by using relevant copy, working on meta titles, meta descriptions, introducing your target keywords, and making it all come together under one concept. Which one? The one covered by the video you want to rank, of course. Basically, you need to put the video you want to rank wherever it fits within your website. If you don’t have such a page, consider creating one from the ground up. Keeping the video in the spotlight while you build the page will make it more likely to appear at the top of the SERPs. The two points above converge into this one. 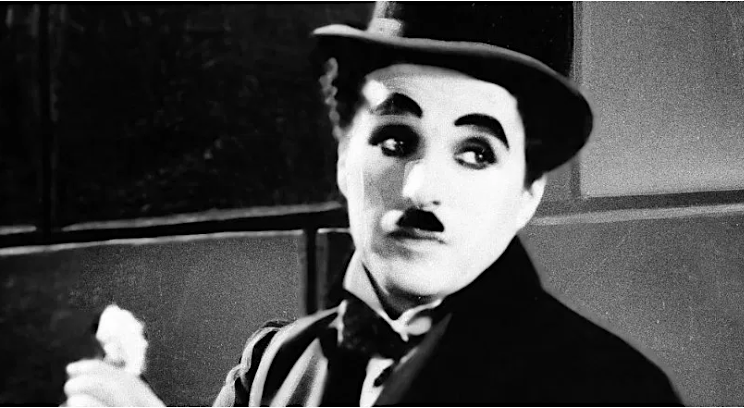 Keeping a relevant video in the center of the stage means creating a unique page for it – i.e. making it the exclusive focus. And if I use the word exclusive it’s because you have to treat your video like a diva. Imagine if a movie star had three movies premiering at the same time. Instead of checking them all out, her fans will divide and pick one of those premieres. That’s what you’d be doing if you built several pages with the same video. By repeating its use, you’re diminishing its impact – and pitting it against itself. The traffic you get will be divided into all those pages and the rankings won’t be as good as if you only had one page. 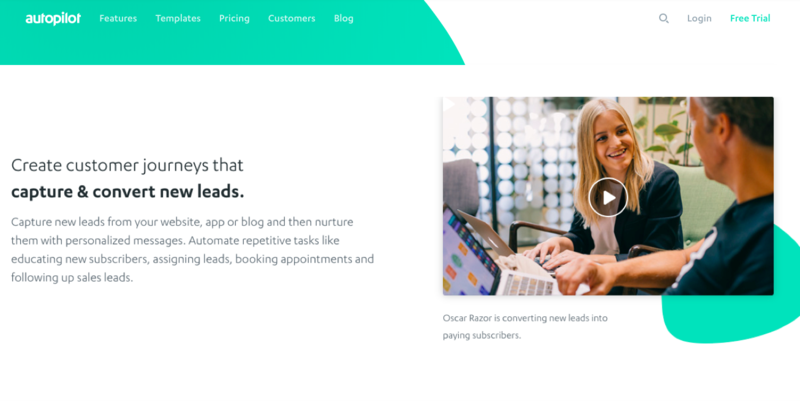 I know you might feel compelled to use that lovely company video you just made in every possible way you can, but when it comes to your website, just put it in a single place. At the beginning of this article, I said that you would to learn about video rankings and its specific workings. That doesn’t mean that you won’t have to use the ol’ regular SEO methods you already know. Some of it has come in handy already (in the video landing page optimization) but it doesn’t end there. Keeping up to date with the latest trends in search habits (such as brands as ranking signals and the influence of GDPR) will quickly show you that there are a lot of things that are changing and will continue to change. As people’s search habits evolve along with new technologies, you’ll have to keep up or risk being forgotten. In that dynamic landscape, my suggestion is for you to bet on a combination of the things that have worked in the past (meta titles, descriptions, alt titles) with some of the newest additions (page speed, mobile-first mentality), all sprinkled with some advertising. Yeah, in case you were wondering, video advertising is a huge deal as some are saying it will come to dominate the next decade. With more and more people and brands putting out explainer videos, customer testimonials, and social video content as part of their marketing, it just makes sense to see more investment being put into paid video advertising. There’s more to traditional SEO when it comes to boosting your video’s visibility. You have to pay attention to technical details, make strategic decisions, embrace aesthetical trends, and never stop optimizing! The competition in the video landscape is fierce and forces you to be at the top of your game. Are you up for the challenge?